Three of four states in matter: solid, gas, and plasma have been all used for THz wave generation for decades. However, until recently, THz wave generation from liquid sources was considered impossible. It is well known that water is a strong absorber in the THz frequency range, therefore liquid water has historically been sworn off as a source for THz radiation. Once thought impossible, we have experimentally demonstrated that liquid water can generate intense and broadband THz waves with the use of femtosecond laser pulses. I will highlight recent development of terahertz aqueous photonics, especially the generation of coherent THz wave from liquid water. 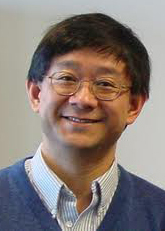 Dr. Xi-Cheng Zhang – Parker Givens Chair at The Institute of Optics, University of Rochester. He is a Fellow of AAAS, APS, IEEE, OSA, and SPIE. His recent awards include 2018 Humboldt Prize; 2017 Australian Academy of Science Selby Fellow; 2014 International Society of IRMMW-THz Button Prize; 2012 OSA William F. Meggers Award; and 2011 IEEE Photonics Society William Streifer Scientific Achievement Award. He holds several professorships in foreign countries, including Honorable Professor at Lemonosov Moscow State University. He has received 29 US patents, authored or co-authored over 300 refereed scientific papers with h-index of 85. Dr. Zhang is the Editor-in-Chief of Optics Letters (2014 - 2019).